PORT KLANG: Residents of Taman Pendamar Indah were shocked by the discovery of a temple idol placed next to the main entrance of Surau Sabilul Huda, here yesterday. It is learnt that the statue - believed to have been placed by irresponsible parties between 2.30pm and 4.00pm - was discovered by the surau's siak (caretaker) who was making preparations for Asar prayers. Mohd Yatim Omar, 64, said he noticed the statue when he was opening the door into the surau at about 4.15 pm. Shocked with the find, he alerted the surau committee members and kariah. "When I returned home from Zohor prayers earlier, everything was fine. However, when I came again to prepare for Asar prayers, the statue was already there. "I do not know the motive behind this incident or of anyone responsible for it. The surau is not equipped with closed circuit television (CCTV) cameras. 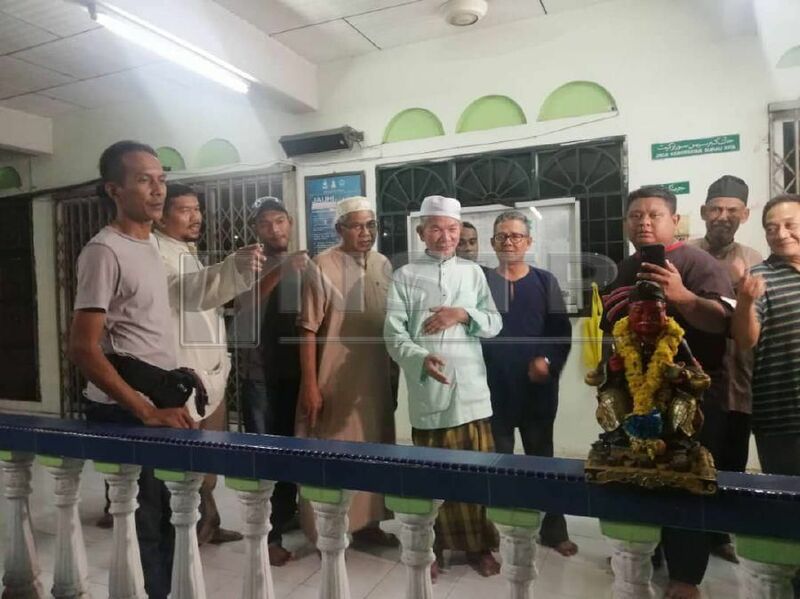 "As far as I know, the surau has never received complaints or has had problems with any parties, other than thefts of donation money which have happened almost ten times," he said when met last night. He said this was a very sensitive issue as it had smeared the place of worship of Muslims. "We are disappointed and hurt by this incident which is an insult to Islam . We urge those responsible for the incident to come forward and apologise. "Initially, we did not want to make a big issue of this incident, but we felt that we should not stay keep silent anymore as it was an acto of disrecpect to Islam," he said. Mohd Yatim said following the discovery, he had lodged a report at the Pandamaran police station, here early this morning and handed the statue for further investigations. Meanwhile, surau committe member Abd Rahman Mohd Shariff, 46, said he was shocked when informed of the discovery. "I felt really upset and angry at irresponsible parties who purposely placed the statue next to the entrance. "This is the first time such a thing has happened here, and I think it should not have taken place at a place of worship. This is a very sensitive issue. We hope the authorities will investigate this matter, "he said.